Scientists have discovered a parasitic insect with a reproductive strategy straight out of an Alien movie. Dubbed the “crypt-keeper wasp,” it infects a rival species with its young, which, after hatching, proceed to chew their way out through the victim’s head. As described in the latest edition of Proceedings of the Royal Society B, the newly-discovered crypt-keeper wasp, formally known as Euderus set, lays its eggs directly inside the larvae of its rival, another parasitic wasp called the common gall wasp (B. pallida). In addition to changing the behaviour of the growing gall wasps, the crypt-keeper larvae go on to consume the internal organs of their victims, and then exit their hosts through the head. Normally, the gall wasp goes about its own parasitic behaviour in peace. Rather than taking advantage of another insect, however, these parasites leech off the plant kingdom. To reproduce, the gall wasp manipulates the physical characteristics of its tree host, the sand live oak, hollowing out its stems. Female gall wasps lay their eggs inside these hollow cavities (called galls, hence the name) which provide sustenance and shelter for the young. Come spring, the baby bugs tunnel their way out of the “crypt,” beginning their lives as mature gall wasps. But this process doesn’t always go as planned, thanks to the devious behaviour of the crypt-keeper wasps. As observed by Rice University biologists Kelley Weinersmith and Scott Egan, female crypt-keeper wasps also lay their eggs in the sand live oak’s hollowed out twigs—directly inside the gall wasp larvae. 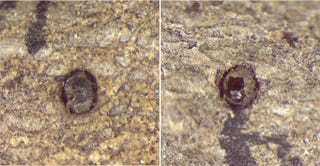 The unwelcome parasitoids, through a process still unknown to the researchers, alter the behaviour of their hosts, causing them to create a smaller exit hole than usual. When the gall wasps are ready to emerge, they get stuck trying to get out the hole. The crypt-keeper larvae then begin the gruesome process of eating their hosts’ internal organs, finally exiting the body—and the hollowed out twig—by chewing an escape hatch through the head.